Click here for audio of Episode 719. Today, let's evolve a typewriter keyboard. The University of Houston's College of Engineering presents this series about the machines that make our civilization run, and the people whose ingenuity created them. My journalist father used to work at his iron typewriter. His two index fingers moved like pistons. You could call it hunt and peck. But it was more like a panzer attack on the keys. By then keyboards had settled on the so-called QWERTY system. Q, W, E, R, T, and Y -- QWERTY -- are still the first six letters on the top row of your keyboard. Stephen Jay Gould, reigning expert on Darwinian selection, asks how in the name of sense we let keyboards evolve that way. By 1880 the QWERTY arrangement had been around for a decade. Most of the 5000 typewriters in use had that familiar keyboard, awkward as it is. But no matter! No one had learned to type yet. There was no method. And when we all used hunt and peck, QWERTY had one advantage. 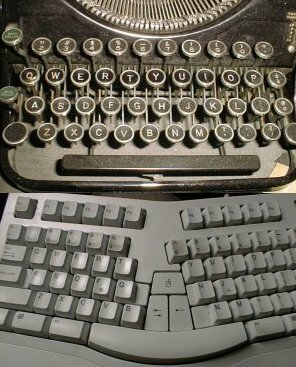 Remember what happened when you hit two keys at once on an old manual typewriter? They tangled and jammed. You had to reach in and pull them apart. The QWERTY system reduced jams by slowing you down. It was harder to pile key strokes on top of each other. But not even that was intentional. In 1867 a typewriter pioneer first set up the QWERTY arrangement so his salesman could peck out the word typewriter quickly and easily. The letters that spell typewriter all lie on the top row. Just think! That's the logic that shaped your computer keyboard. After 1880 businesses saw how useful typewriters could be. Sales rose. Then a Cincinnati business-school teacher invented our eight-fingered method of typing. She hadn't yet thought of memorizing the keyboard. But a student of hers had. He entered a speed contest in 1888 and trounced a competing keyboard. Never mind that eight-fingered touch-typing could be a lot faster with a better keyboard. QWERTY won in 1888, and we still use it. Never mind that the much-used letter A sits under your weakest finger. Never mind that the most-used letter E is off the home row. QWERTY survives because it won a contest a century ago. For Gould, this is a metaphor for the mindlessness of evolution. But he adds a redeeming remark. He says, "Streamlined optimality contains no seeds for change." Maybe our clumsy keyboard has driven us to create better typewriter mechanisms. But there's another reason for QWERTY's survival. I'm fast enough on my QWERTY keyboard to make it feel like I'm thinking my words onto the screen. That's because I've developed my touch-typing skill until it gives me real physical pleasure. That's kin to the 2-fingered kinesthetic energy my father once flung at his old manual machine. So it's clear that more is at play in adapting a machine -- or a species -- than cool reason tells us. Gould, S.J., The Panda's Thumb of Technology. Bully for Brontosaurus: Reflections in Natural History . New York: W.W. Norton & Company, 1991, Chapter 4. He points out that we can do better.